I’m a big fan of game companies stepping outside the norm every once in a while and trying something different, even within their own established genres. 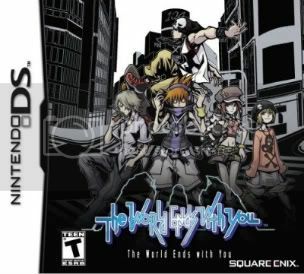 The World Ends With You, which I will refer to as TWEWY from now on, is a unique action RPG game that stands out from other Square Enix games for many reasons. The game takes place in a realistic setting, in the modern-day Shibuya shopping district of Tokyo. 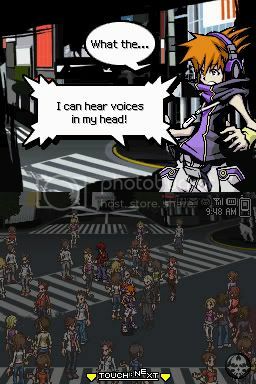 You’re a 15 year old boy named Neku who one day wakes up in the middle of the bustling streets without a memory of how he got there. He finds himself thrust, unwillingly, into ‘The Game’ of survival, where he must complete a series of missions over the course of a week to prevent being ‘erased,’ or ceasing to exist. How does the game play? I would describe it as an action game with heavy RPG elements. 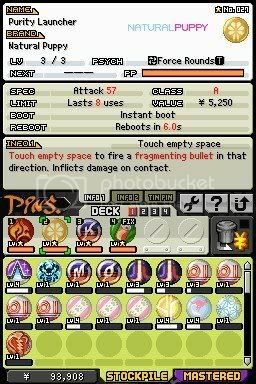 The game uses an equipment system through ‘pins’ that lays the foundation for much of Neku’s customization for the kinds of moves, status enhancements, and attacks you will use in battle. You will find a wide assortment of pins in the game that you can equip and use during battle. Most of them have a specific attack, but others allow you to heal or affect some of your stats. The pins can also level up as you use them and even ‘evolve’ into more powerful pins. All battles take place in real-time and on both DS screens, with one character on the top and the other character on the bottom. This makes the action very intense as you try to manage control of both the top and bottom screen. But don’t be intimidated right off the bat. Since it’s unrealistic to expect the player to flawlessly control two different characters simultaneously on different screens, the game does a great job of easing you into the role and making it simpler by doing things like allowing customization of whether the extra character will operate on ‘auto-pilot’ (with varying degrees) though you can always manually control that character’s inputs at any time. This is a game that you can definitely wear out your DS touch screen on. During battle, you control Neku’s movements with the stylus, and every one of his actions uses the stylus in some manner, whether it’s tapping on enemies, swiping across Neku himself to initiate an attack, dragging objects around, drawing circles on the screen to create force fields… This is also one problem with the controls: Because there are so many different kinds of touch moves that you can use for Neku, sometimes you may end up performing one move when you actually intended to perform another. And unlike old-school RPGs where you frequently encounter random enemies as you walk around, this game, for the most part, gives you full control over when you actually want to enter battle. (There are still some mandatory missions where you are required to defeat enemies before moving on). You can even choose to have a chain of enemy battles without resting in between, which in turn yields greater rewards. Again, the game emphasizes giving the player a lot of freedom, making your playthrough quite different than anyone else’s. In addition, the game keeps track of stats for all the collect-a-thon freaks out there. The enemies you encounter are recorded in your encyclopedia, the pins and items you collect are all tracked, so you can easily obsess over ‘finding everything’ this game has to offer. The entire customization has many layers of complexity due to (a) the clothing system and (b) the food system. Every piece of clothing and every pin you equip is tied to a specific brand. Just like in real life, there are many different brands, and the game actually tracks which brands are popular for each region you are in. This actually has a huge impact on the gameplay and on your purchasing decisions. The food system allows you to ‘equip’ food, which you will slowly digest over the course of a number of battles, and there is a limit where you can only digest a number of ‘bites’ within a real-world calendar day (using the DS clock). The DS clock is even used to reward you when you are not playing the game: your pins actually gain experience points whenever your DS is turned off. The customization goes even further and you actually have full control over how easy or hard you want the game to play. In the options menu you can change the difficulty at any time, you can even downgrade your experience level at any time if you want to pick up cooler rewards in battle, and when you die at a boss fight you can simply retry on an easier setting. I like how the characters are established. Some players may find Neku annoying at first; he’s anti-social, perhaps selfish, without having one care about others. But as the story progresses Neku grows along with it, and his character becomes much better fleshed out. At times this character development starts to tread lightly into a ‘cheesy’ or ‘sentimental’ mood (and actually reminds me a lot of the character development used in the Kingdom Hearts series), but overall characters are believable. Music may be a turn-off for some players. I actually enjoyed the music very much while I was easing into the game, but the longer you play the game the more you will start to hear the same music over and over again, and become a little bit annoying, particularly if you’re not a fan of the vocals used for the majority of the songs (cool thing is there are both English and Japanese lyrics). Think J-Pop for some of the music, some hip-hop, rock, and electronic. However, I started liking the music even more toward the final portion of the game. The game has a graffiti-art stylized look, with bold character design. Most of the graphics are detailed 2-D sprites, and it’s nice to walk down the streets of Shibuya and see the screen filled with its residents walking the streets. The same graffiti-art is applied to the enemies known as the Noise, making it very interesting as you look forward to what the next enemy shape may be like. There are clever uses of polygonal backgrounds used to bring out the depth of the streets and the immensity of the cityscape. There are nice details in the environments, with different structures moving in and out of the foreground. This attention to detail helps prevent the game from becoming a repetitive visual bore, considering you’re stuck in the same city for the whole game. The city is large and diverse enough as well. Bottom line: If you’re looking for a heavy action RPG game full of character customization and a mysterious, compelling story where you eagerly anticipate the next piece of the plot unraveling, then, by all means, check this game out. Where does the music game genre go from here? The customization in this game is insane. Not just character customization, but gameplay customization. And not just in the actual action portions, but choices about difficulty levels and how to get XP and such. Never seen anything like it. I loved the battle variety (because of the different types of attacks with the pins, which actually required different stylus moves (the only other game I can think of that had variety like that was Ninja Gaiden). And the multitasking, kept things interesting, with bonuses if you could do it. I was a little disappointed that my outfits didn't change visually, lol. But it was fun choosing from brands, rather than "iron armor" "silver armor" etc, like in regular fantasy RPGs. I didn't get into this game. I couldn't wrap my head around the controls or the battle system. It seemed way too confusing. "CRUNCH! I'll add it to the heap." @heliumsky I knew you'd show up! Your user icon speaks loud and clear. Given the crazy amount of different clothes and accessories, I definitely don't blame the developers for not actually changing the character sprites to reflect what you're wearing, though some other games do that (Dragon Quest IX, or so I've heard?). I didn't mention it in the review, but there's a whole mini-game mode apart from the main story called Tin Pin Slammer, where you drag and release the Tin Pins on a game board to slam the opponent's pin off the edge. It's not as deep as some of Square's other mini-games they tuck into their RPGs (like the card game in FF8 or blitz ball in FF10), but it was a nice diversion. I've got to get back into this game. I played a bit for the Radio Free Nintendo Game Club, but I never got past the first couple of days. And I don't really understand the battle system yet, either. Give it time. The battle system becomes very rewarding. I ended up seeking out battles even though you can ultimately avoid them if you choose to do so. Yeah, I didn't write it off. I just didn't play enough for it to 'click'. I didn't really care for moving and attacking with the stylus, though. I played it a bit for the RFN Retroactive thing, but didn't stick with it. The battle system was fine with me, actually, I really liked it. And I liked how customizable EVERYTHING is. But getting around was annoying, what with the various walls and the (IMO) lacking map system. Maybe if I were Japanese and knew the first thing about Shibuya, I'd actually be better able to get my bearings, I don't know. QFT. I loved how this game basically played out however the heck you wanted it to. I loved the pin system SO MUCH. I loved the dual-screen combat, the music, and hey, even the story was fairly decent. Definitely one of the best RPGs on the DS, and one of the best action-RPGs I've ever played. WE NEED A SEQUEL!!! A rare piece of brand new greatness from Squeenix. Probably harmless, but not taking chances. BBot. I never beat this game, but I love playing it. Every couple of weeks I will just pick it up and play for an hour, just battling noise. The battle system was awesome, and so was the music. I love how rewarding the game becomes once you get into a groove and start actually being able to keep the battle rhythm going between the two screens. i am hoping for a sequel to this one. I really enjoyed the music, too. Very different. Speaking of which, the music in Arkanoid DS is also different, but kind of horrible. @anandxxx I don't know if the battle system ever really fully "clicked" for me, I just got to the point where I started mostly ignoring the top screen and then I could kind of get it. It was definitely a trick of establishing a rhythm, looking at one screen, then the other to get the combos bouncing back and forth. I never mastered it, that's for certain. But there were times when I could keep it up for a while.